Your wedding day is one of the most important days of your life. You want every aspect of your day to be perfect: from the moment you walk down the aisle until you dance your first dance together as a married couple. If you are looking for a way to add a touch of romance to your special day, why not go with heart shaped wedding sparklers from Wedding Sparklers Outlet? What Are Heart Shaped Sparklers? In essence, heart shaped wedding sparklers are just the same as standard wedding sparklers, but instead of being straight, they are bent into the shape of a heart. There are so many different ways you can use these amazing sparklers to add even more romance to your special day. Ours do not smoke when they burn making them safe for indoor use. 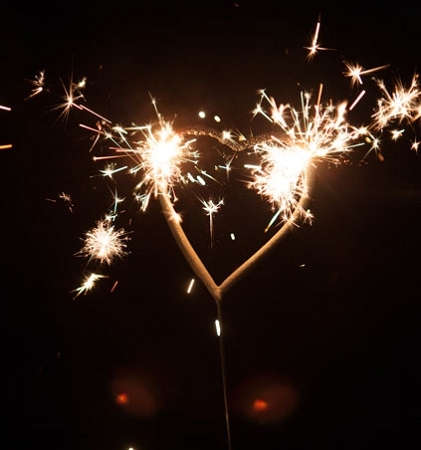 You can give your guests heart shaped wedding sparklers before your ceremony. Then as the two of you are exchanging vows, have them light them and illuminate this very special moment. Maybe the bride and groom can have one to hold after they have been pronounced husband and wife. Talk about perfect photo opportunities to add the scrapbook! If you have been looking for the perfect wedding favors for your guests as they take their seats at their tables, heart shaped wedding sparklers offer a unique touch. Add them to your table centerpieces to keep the romantic feeling going. Have someone light the heart shaped sparklers just before everyone walks into your reception. The smokeless sparkle will illuminate the tables and provide a warm romantic welcome for everyone young and old to enjoy. Then when the time comes for the all-important first dance, your guests can light their sparklers and surround the happy couple with sparkling heart-shaped light. Turn down the house lights and enjoy this incredibly romantic and special moment before letting others join in the dance. Be sure you provide several buckets with water in them for everyone to put their burned-out sparklers in for safety. One of the coolest things about heart shaped wedding sparklers is that you can light them at any point in the heart. You can light one end and let it burn to the other, you can light one right in the middle and let it burn from the center to each end, the decision is yours. No matter how you look at it, these sparklers are sure to add plenty of romance to your special day. No wedding would be complete without the traditional wedding gauntlet of friends and family who line up facing each other to wish you well. Traditionally, the guests have thrown rice or confetti over the couple as they pass through, but this is so "been there, done that". If you really want to be sent off in style have your guests light their heart shaped sparklers and light your way off into the stars and your new life together!